Revin Fellows was raised in the Chatham neighborhood on Chicago’s South Side. On his way to play basketball at the Chatham YMCA, he would often pass the neighborhood drug dealers, who encouraged him to stay focused on his education. “In our community the protection and the encouragement came from low-level guys standing on the corners,” Fellows says. The 54-year-old former athlete went on to earn a bachelor’s degree in physical education and health from Aurora University and has devoted much of his life to mentoring youth in poor neighborhoods. 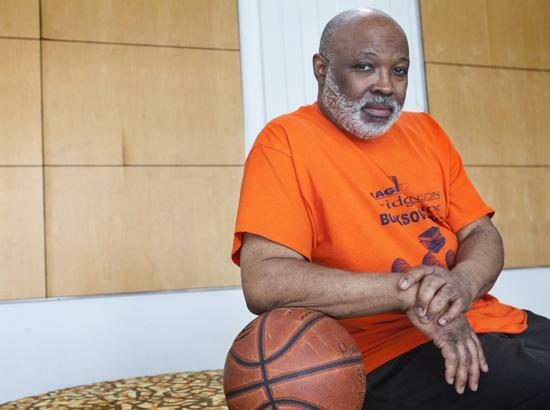 He helped start Book over Balls, a non-profit organization that mentors Chicago’s youth and stresses education over violence. The Chicago Reporter talked recently with Fellows about sports, education and making a difference. What is Books Over Balls about? We use basketball as a motivation to bring young men back to getting their education with organized basketball tournaments like Battle for the Rim. In which communities does the organization work? We work with kids from South Shore, Austin and Englewood. We try to work with kids from all over Chicago and other organizations. What are some of the methods you use to reach the youth? You have to be honest with them and keep it positive with them, and you have to show them that you are for real, and we did that with our basketball showcase. Does your organization offer any kind of structure? Yes, because books are first what gives kids structure. You can’t play basketball or be in this program without being in some sort of academics, and if you are not, we are going to help you with that. It’s about getting an education first. How has your organization developed a partnership with former NBA player Earvin “Magic” Johnson’s alternative school Bridgescape Academy? We were already in the South Shore neighborhood doing work with Henry English who is the president of “Black United Fund of Illinois” in the South Shore area. We went to talk to him about what we were doing, and in that same night Mr. English held a meeting with all the youth connectors in the area, and Magic Johnson and Will Polite, who is Bridgescape’s vice president of development, were both in the room. We had introduced ourselves, and talked about our organization and Magic Johnson visited our organization to see what we were doing and we made a connection. How has Book over Balls made a difference? We were able to get 80 young men off the streets and into the gym. This past August we teamed up with NBA star Will Bynum’s Elite Basketball Camp and had kids signing the Non-Violence Task Force Bill with Gov. Pat Quinn and State Rep. La Shawn K. Ford in pledging to stay away from violence. What are some of your strength and weakness? My weakness is being overly committed because I know we are in a crisis and it’s not normal. We’re losing too many babies. It’s a passion. When I was younger I had guy’s mentoring me and helping me stay out of trouble. I’m trying to influence what they gave me.